Ashish Parmar’s photograph only one from India to make the cut. 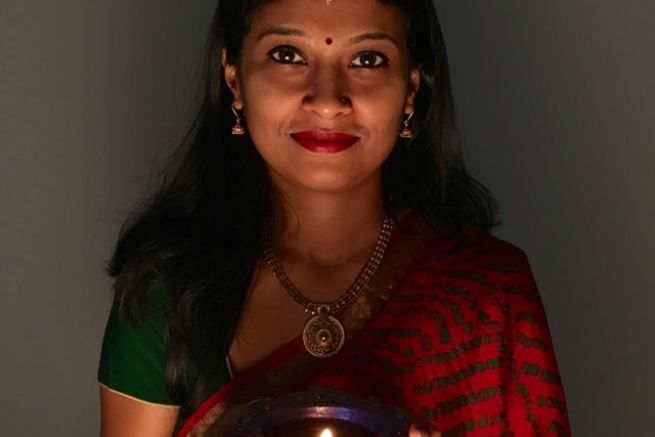 When Bengaluru resident Ashish Parmar shot a candid portrait of his wife on his latest iPhone 6S, little did he know that it could reach millions of people across the globe through the billboard ad of Apple. Soon after clicking the image, Parmar posted the same on Instagram with hashtag #ShotOniPhone6s. Later, Parmer being a professional photographer got engrossed in his work and forgot about the contest until he got a call from Apple informing him that his photo has been selected out of millions of iPhone images to feature on the official iPhone billboard. They asked him permission to use the image of his wife holding a diya in her hand in a red saree. “They asked if I would like my wife’s photo ‘all over the world’. I was ecstatic. It was too good to be true, on both a personal and a professional level,” Parmar told The Indian Express. Parmar said that it was a photo taken during Diwali celebrations at his house. “It was Diwali and she was helping my mother place diyas around our house. I just came out and saw her walking with a plate full of diyas and it caught my eye… how the light was beautifully falling on her face. Being a photographer and of course, a husband who loves his wife, I just pulled out my phone and asked her if she could just pick one diya and stand by the wall. It was a candid and random shot,” he said. Parmar is the only Indian resident who got selected for the advertisement campaign that began on February 1. Apple has selected 53 photos from across the world shot by people using iPhone 6S and posted on social media. Though Parmar is a professional photographer, he hasn’t undergone any training to acquire skills needed for the profession. Keener in wildlife photography, he covers events ranging from weddings to high-profile events like Indian Premier League (IPL).